MANILA – The Department of Tourism (DOT) is optimistic that Philippine Amusement and Gaming Corporation’s multi-billion Entertainment City project will make the country “more fun” to visit and help DOT achieve its targeted 10 million annual tourist visits by 2016. As this developed, Jimenez said Pagcor Chairman Cristino Naguiat Jr. is on top of the situation in so far as accusations of impropriety hurled against him by casino magnate Steve Wynn are concerned. Earlier, Malacañang said the counter-complaint of Japanese casino magnate Kazuo Okada clearing Pagcor officials of any wrongdoing bolsters Naguiat’s position that the accommodation he received last year in Macau was “industry practice” among casino operators. “This certainly supports the position of chairman Naguiat that he did not do anything wrong,” presidential spokesperson Edwin Lacierda said. Okada denied that his firm, Universal Entertainment, did anything improper to obtain favors from Naguiat and other Pagcor officials in connection with plans to put up a $2 billion casino resort in the country. Naguiat earlier said Entertainment City will make the country one of the world’s leading gambling destinations, thus resulting in a huge “trickle down” effect to the Filipino people, most especially the poor being helped by Pagcor. Pagcor currently finances many of the government’s social, civic, educational; and environmental projects and programs. Bureau of Treasury data showed that Pagcor has remitted P11.437 billion to the national government last year, exceeding expectations. BOT said the P11.437 billion signifies a 4.5% over the projections of the Department of Finance. The increase is also 10.5% higher than Pagcor's remittance of P10.343 billion in 2010. Naguiat attributed the growth in income to the improved gaming mix in casinos and enhanced marketing and gaming offerings of its casinos. Pagcor operates 13 Casino Filipino facilities and has 4 licensed casinos – Fontana Casino and Fort Stotsenberg in Pampanga, East Bay Casino in Rizal and Poro Point Casino. TACLOBAN CITY – PhilHealth is encouraging the online crowd to help map up all health facilities in the Philippines in order to maximize the benefits of the social networking platform. Atty. Jerry F. Ibay, PhilHealth-8 Regional Vice-President said that recognizing the strong presence of Filipinos on the Internet, PhilHealth hopes to gather their support to pin all health facilities on an online map. PhilHealth will then display data over the facilities to better inform the public about available services in those facilities as committed to the Corporation. In support to the Administration’s Kalusugan Pangkalahatan, the Philippine Health Insurance Corporation (PhilHealth) recently launched the first of its ‘Crowdsourcing for Health’ initiatives using GoogleMaps. Crowdsourcing is defined as the act of taking a job traditionally performed by a designated agent (usually an employee) and outsourcing it to an undefined, generally large group of people in the form of an open call. Leveraging the free services of Google Map Maker, PhilHealth, under the leadership of Dr. Eduardo P. Banzon, president and CEO, invites the Filipino community to start pinning both public and private health facilities on the online map. The health facilities would range from hospitals, birthing homes or lying-in centers, private medical clinics, government health centers, dialysis centers, pharmacies, laboratories, and blood banks. Other health facilities can also be added. Meanwhile, Ms. Marimar Zabala, information officer of PhilHealth Tacloban said that if one cannot pin the health facility on Google, he or she may opt to use the open source-based OpenStreetMap.org. Interested crowd-sourcers are encouraged to pin as many health facilities as they can using Google MapMaker at www.google.com/mapmaker or OpenStreetMap at www.openstreetmap.org. PhilHealth will display a summary of the health facilities at the map on its official website, www.philhealth.gov.ph under Online Services. One does not have to be a health professional to join in the endeavor, Ms. Zabala said. All that is needed is the desire to join in the bayanihan effort. The goal is to encourage Filipinos to join the race to universal health coverage. TACLOBAN CITY – The visa reforms which will soon be implemented will boost the competitiveness of the Philippines as a tourism destination. DOT Region 8 Director Karina Rosa Tiopes informed that the new visa policies was agreed upon by DOT Secretary Ramon R. Jimenez, Foreign Affairs Secretary Albert del Rosario, Justice Secretary Leila Delima and Bureau of Immigration Commissioner Ricardo David. Director Tiopes said that among the new visa policies agreed upon include the increase in the visa-free privilege for 166 countries/territories from 21 to 30 days. Another new policy is the granting of a 30-day visa-free stay to Chinese nationals travelling to the Philippines as part of a tour group handled by a Department of Tourism-accredited Philippine tour operator. Moreover, there is also the new policy granting a 14-day visa-free stay for Indian nationals who have a valid American, Japan, Australian, Canadian, Shengen, Singapore, or United Kingdom visa. Director Tiopes said that the DOT Secretary underscored that the implementation of these new policies is part of the Aquino Administration’s efforts to attract more foreign tourists and spread the benefits of tourism to the countryside by simplifying entry requirement procedures and processes and allowing them more time to experience what the Philippines has to offer. This will definitely help in achieving the DOT’s target of 10 million foreign visitors by 2016, Director Tiopes echoed the Secretary. Secretary Jimenez believes that there is a need to address the perception abroad that it is difficult to enter the Philippines. With these visa reforms, the Philippines will be at par with the entry policies of neighbours in the region and, for some markets, more liberal. Thailand, Singapore, and Malaysia allow entry of nationals of most countries without a visa for stays of up to 30 days. Tourists entering Cambodia are issued visas upon arrival valid for one month, except for nationals of ASEAN countries who are allowed to enter visa-free. Other policy reforms, including a special long-stay visa for active retirees, are currently being reviewed by a working group composed of representatives from the Department of Tourism, Department of Foreign Affairs and Bureau of Immigration, Director Tiopes said. TACLOBAN CITY – The Eastern Visayas Ecumenical Forum on People’s Mining was held on 19 Mar 2012 at Cawaksi Learning Center, San Jose Tacloban City. The forum Head of the Conveners were Bp Dulce Pia-Rose of United Church of Christ in the Philippines (UCCP), Rev Fr Victor Palero of Iglesia Filipina Independiente (IFI), and Msgr Walter Cerbito of the Roman Catholic (RC). The forum underscored the unity statement of the aforecited religious groups. The statement claimed that it is imperative of the faith of the religious in Eastern Visayas to join hands and lives to preserve and defend the wealth God has bestowed on the people. Six (6) Bishops and their clergy in the Roman Catholic Dioceses of Catarman, Calbayog, Borongan, Palo, Naval, and Maasin; with the Conference Ministers, Pastors and Lay Leaders led by the Area Bishop in the East Visayas Jurisdiction of the United Church of Christ in the Philippines; and with the Bishops and Priests of the Diocese of BILLESA (Biliran, Leyte and Samar) of the Iglesia Filipina Independiente have shown their unequivocal position against the large-scale mining. The statement averred that Samar, Leyte, Biliran and Masbate, among others, has been desecrated and destroyed for ages now by a few and powerful mining foreign investors with their Filipino counterparts as their dummies and in cahoots with the government. This has made impossible the distribution of unused public lands and the tenanted lands of the rural landlords to the landless farmers. In spite of all this exploitation that could be valued in billions, we know there are still trillions of pesos worth of bauxite, chromites, pyrite, nickel, copper, gold, uranium, coal, aluminium, vanadium, titanium, and 20 other mineral deposits left in the whole of Eastern Visayas. The unity statement calls to stop the wanton anti-people exploitation of foreign and local mining companies, to junk or repeal Mining Act of 1995, to support and uphold People’s Mining Bill 4315, and to call for all parishioners of RC, IFI, and UCCP to participate in the education, mobilization, and organization programs and activities on upholding the People’s Mining Bill 4315. GOVERNMENT CENTER, Palo, Leyte – For the 60 schools in the DepEd Leyte Division that have availed of the DOST STARBOOKS, the common problem of old fashioned and incomplete libraries in schools is now a thing of the past. STARBOOKS, or the Science and Technology Academic and Research-Based Openly-Operated Kiosk Station, is the First Philippine Science Digital Library developed by the Science and Technology Information Institute (STII) of DOST. It is a system that provides free access on S&T information for academic and livelihood use, DOST Director Edgardo Esperacilla, informed. The system provides relevant and latest information on S&T subjects. Users can have access to thousands of titles of books, journals, scientific researches, technical and annual reports and other latest data and information contained at the DOST’s Science Information Network (SciNeT), Philippine eLib project sources, freely-available online resources, and subscribed databases. The recipients of the project are selected educational institutions/libraries in Leyte Division with S&T priority subjects in their curriculum. The project also aims to create and enhance interest of students in the field of S&T, encourage their great and curious minds to develop new ideas, inventions and innovations and stimulate and inspire their capacity to get involved in research and entrepreneurship. DOST Leyte Provincial Director John Glen Ocana said he is happy that when he informed Leyte Division Superintendent Sarah Apurillo about the STARBOOKS, she readily accepted the idea. Director Ocana said that at least 60 schools of the Leyte Division have already availed of the STARBOOKS. These schools include Palo National High School, Tanauan National High School, Julita National High School, Tolosa National High School, Cassidy Elementary School, Library Hub of the Division of Leyte, Burauen Comprehensive National High School, Palo I Central School, Santa Mesa, Dagami National High School, Justimbaste-Remandaban National High School in Tabon-Tabon, Granja-Kalinawan National High School in Jaro, Tanauan I Central, Sta. Fe Central School, Alangalang National High School, MacArthur National High School, Astorga National High School, San Joaquin National High School, Carigara School of Fisheries, Tanauan School of Craftsmanship and Home Industries, Burauen South District, and Binongtoan Central School at Alangalang II. The second batch of schools that availed of STARBOOKS includeHindang Central School, Abuyog National High School, Plaridel Central School, Javier National High School, Bontoc National High School, Hampipila National High School, Baybay National High School, Bato National High School, Matalom National High School, Mahaplag National High School, Hilongos National Vocational School, Plaridel National High School, Bunga National High School, Caridad National High School, Inopacan National High, Baybay I Central School, Inopacan Central School, Sta Margarita National High School, Hindang National High School. The third batch of schools consists of Calubian National High School, Leyte National High School-Main, Leyte National High School- Consuegra Annex, Damulaan National High School, Kananga I Central School, Matlang National High School, Marcelino R. Veloso National High School, Isabel National Comprehensive School, Tabango Central School, Tabango National High School, Muertegui National High School, Dr. Geronimo B. Zaldivar Memorial School of Fisheries, Calubian South Central School, San Isidro National High School, Merida Vocational School, Leyte Agro-Industrial School, Matag-ob National High School, and Palompon North District. Other schools that wish to avail of the STARBOOKS will be given the contents/software for free. However, they are required to provide for the computer system with the minimum requirements specified for the installation of the STARBOOKS software, Mr. Ocana said. QUEZON CITY – Newly elected student leaders of top universities and colleges of the country have come out in support of the call to vote on the RH Bill. The RH Bill or Reproductive Health Bill is currently being deliberated in Congress and in the Senate. But supporters of the bill say that the RH Bill has been languishing in both Houses of Congress for more than 10 years. “For us, the RH Bill is pro-youth and to be anti-RH is to be anti-youth.” This is the strong statement of Gibby Gorres, National Secretary-General of the Student Council Alliance of the Philippines (SCAP). SCAP has 150 member universities, colleges and student political parties all over the country. “We believe that more than 10 years of debate is enough time for our leaders in the House and in the Senate to make a decision.” Benjamin de Leon, President of the Forum for Family Planning and Development (The Forum) said. The Forum is an NGO pushing for the passage of the RH Bill and a partner of SCAP. According to the Commission on Higher Education (CHED), college enrolment continues to rise yearly. In SY 2010-2011 there were 2.63 million enrolees and 2.66 million enrolees for SY 2011-2012 in 1,793 higher education institutions nationwide. “We were elected in our respective schools because we would like to believe that our fellow students know that we will speak out for their rights. I support the passage of the RH Bill because millions of young people suffer from RH related issues such as HIV/AIDS, teen pregnancy and even maternal deaths,” said Robby Camagong, former student council member of De La Salle University and officer of Student Council Alliance of the Philippines. “The voice of the youth should not be ignored in the debate on the RH Bill. According to the NDHS (National Demographic and Health Survey), 10% of all 15-19 year old girls are already mothers. Needless to say, a legislator who is deaf and blind to the needs and sentiments of his or her constituencies, especially young people, does not deserve a seat in Congress.” Gorres said. Gorres also says that he is confident that the student councils can exert influence among students in their schools even in their support for pro-RH candidates in the next national elections. “RH will be the main agenda of the youth for 2013. We see that RH is an issue of our generation more than anyone else's. Congress must end the debates and vote for the passage of this long overdue bill. A vote for RH is a vote for 2013.” Said Heart Dino, Chairperson-elect, UP Diliman University Student Council. Dino also made history for being the first transgender to be elected as student council chair of the University of the Philippines. Among the SCAP members who joined the press conference include student council elect from UP Los Baños, Diliman and Manila, University of the East, Philippine Normal University, Polytechnic University of the Philippines, Ateneo de Manila University and Pamantasan ng Lungsod ng Muntinlupa. QUEZON CITY – Families of the Disappeared for Justice or Desaparecidos today welcomed the passage of House Bill 98 “An Act Defining And Penalizing Enforced Or Involuntary Disappearance And For Other Purposes” or the Anti-Enforced or Anti-Involuntary Disappearance Bill on its third and final reading at the House of Representatives. “We welcome the House of Representatives’ action of passing the bill in its third reading. This is a step towards ending the impunity by which perpetrators of this most heinous crime commit human rights violation in this country. A law criminalizing enforced disappearance is long overdue. We hope this will be enacted into law at the soonest time possible,” said Desaparecidos secretary general Mary Guy Portajada, whose father, unionist Armando Portajada, was disappeared more than 25 years ago. “We hope that our legislators in the Senate also realize the significance of passing this bill as enforced disappearance is still committed today even as we have a “new” administration,” Portajada declared. Portajada said that they hope “the bill’s passage will help families of enforced disappearances prove that state forces are behind the abduction of their loved ones.” She pointed out particularly Art.12 of the said bill stating the Liability of the Commanding Officer or Superior as principal to the crime of enforced disappearance, either in assisting, abetting or allowing, whether directly or indirectly the commission of his or her subordinates. “This will also serve as warning to state agents who continue to enjoy impunity under the current administration,” she said. For her part, Edita Burgos, mother of missing Jonas Burgos, said that while they welcome the bill’s passage, the pain and agony of families searching for their loved ones never stop. “As long as they remain missing, we will feel the pain every day,” Burgos said. Burgos also said families of desaparecidos (Spanish term for “the missing”) will continue to exhaust all means to seek justice. The group said they shall continue to echo the call to arrest retired Maj. Gen. Jovito Palparan, who remains a fugitive three months after the warrant against him and four others was released at the Malolos Regional Trial Court. “We now appeal to our legislators to help us in seeking justice for Palparan’s victims. He is one of the operators and masterminds of many enforced disappearances in the different regions in the country, his kidnapping case is actually not enough to punish him. But we need to get him soon,” Portajada said. Palparan, along with Master Sgt. Rizal Hilario, Col. Felipe Anotado and Staff Sgt. Edgardo Osorio, were charged with kidnapping with serious illegal detention for the abduction and disappearance of UP students Karen Empeño and Sherlyn Cadapan. QUEZON CITY – The Samahan ng mga Ex-Detainees Laban sa Detensyon at Aresto or SELDA welcomed today the passing of House Bill 5990 or "An Act Providing Compensation to Victims of Human Rights Violations During the Marcos Regime, Documentation of Said Violations, Appropriating Funds Therefor and for Other Purposes" on third and final reading at the House of Representatives. “We are now up to another step for the enactment of the bill into law, with the passing of HB No. 5990 in Congress,” said Trining Herrera, a former political prisoner during the Dictatorship and Board Member of SELDA. “Our lobby efforts at the House, is seeing its fruition today,” she said. However, the group said their work is still undone. “Unfortunately, the Senate has yet to act on their version of the bill and we still have a long way to go, to lobby, remind, and push our Senators to respond in the same manner Congress has done.”Herrera stated. If enacted into law, the bill will allow the indemnification of 9,539 victims of martial who filed the historic class suit in Hawaii against the Dictator, Ferdinand Marcos; as well as other vicitms of martial law who are not members of the said Hawaii class suit. If the Senate passes the bill on third reading, representatives of both Houses of the Legislature will meet to harmonize the provisions of the bill that will finally be implemented as the Law. “While we commend our representatives at the Lower House in passing the bill in third reading, we would like to remind them and their colleagues in the Senate that we hope to see a Law that reflect the victims’ interests and voices so that at least a component of justice will have been served the victims,” Herrera concluded. Phil. Army 8th Infantry Division gain added strength in new soldiers; Armed Conflict far from over? CATBALOGAN CITY – One hundred one (101) warm and able bodies is the addition to the strength of Philippine Army’s 8th Infantry Division after intense months of training. MajGen. Mario F. Chan, Commanding General of the said division, beaming with pride presented the new soldiers to the parents and other guests on the occasion of the graduation ceremony at the grounds of Camp Lukban, Catbalogan City over the weekend. The guest of honor of the occasion is Customs Deputy Commissioner Retired General Danilo Lim. The three hour graduation ceremony showed how prepared the new and young soldiers to fight the state enemies and to defend the public and uphold the country’s constitution. “Handa na po sila na protektahan ang katahimikan ng ating bansa laban sa mga kaaway nito”, General Chan said in his message. In the ceremony, the new soldiers enthusiastically showed their knowledge in various trainings they acquired. Among them is the Basic Military Training specializing in Jungle Warfare Military Operations Course where they conducted in the jungles and mountain ranges of Samar Island. Notably, in the graduation ceremony is the oath to uphold human rights led by Assistant Division Commander Colonel Espenile and the distribution of rosary beads led by Calbayog Archbishop Artemio Abarquez. “Sa ganito pong mga ceremony dapat po laging may bago, lalo po natin itong pinapaganda” General Chan said in his message. 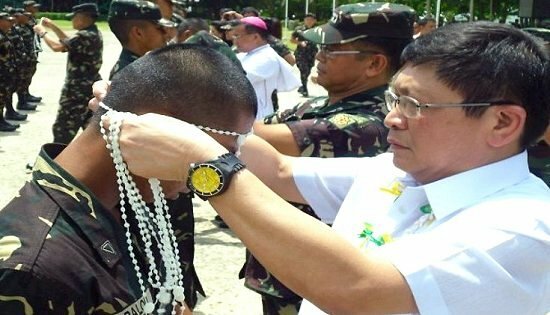 The rosary beads was blessed by the Bishop during the graduation rites and put in by the guests to the neck of the soldiers. “Ang pagpapasuot ng mga rosary ay nakakaantig ng damdamin” according to a parent interviewed by the writer who requested anonymity. “Ang kapayapaan higit sa ano pa mang bagay dito sa mundo ang higit na kailangan natin lahat, lalo na po kung kapwa Pilipino ang nagaaway at nagpapatayan. Sana gabayan po ang aming mga anak na bagong sundalo”, another parent emotionally adds. Current military and New People’s Army encounters in the hinterlands of Samar Island caused so much in the lives of Samar people. According to some inputs in recent Samar Provincial Peace and Order Council meeting, residents of far flung community which are considered conflict areas bear the effect of the so called “encounters” as called by the locals. These people are directly affected thus the domino effect goes out to the urban residents in terms of economic activity of the three provinces in the island while the number of casualties are increasing and human rights violations resulted to displacements of families in the affected areas. The National Statistical Coordinating Board lists the province of Samar as among those in the poorest areas. The high poverty threshold is attributed to the decades of insurgency problem. It is known to many that the government has a handful of interventions in the province to address the issue of poverty and insurgency but the question of effectiveness of those interventions is in peril due to its impact. To address the issue anew, the national government is again pouring its poverty reduction programs in the island. Such are the PAMANA of the Office of the Presidential Adviser on the Peace Process and DSWD’s Kalahi-CIDSS Program among others. “But for how long and how effective are the said programs remains to be seen” according a member of the peace and order council who requested anonymity. “The issue of a community driven development approach is significant in the quest for peace in the province”, he adds. “While the government pours in national program, the local government units should sincerely be ready to support it and involve the most affected community in the process. The felt need of the people should always be considered, until then peace will still remain to be elusive” he adds.